Why rent a car in Belfast? Long underrated as a destination for tourism, Belfast is finally starting to receive the attention it deserves. This city has everything from fascinating history to beautiful green areas, local markets, and famous pub culture. With a rental car, you can also go on to explore the rest of Northern Ireland and the neighboring Republic of Ireland. Belfast International Airport. The busiest airport in Northern Ireland, Belfast International serves more than 6 million passengers every year. The airport is located about 21 km (13 mi) northwest of the city proper. Belfast City Airport. Also known as George Best Airport after the famous Northern Irish footballer, the smallest of the two city’s airports is a base for Flybe and is also served by a handful of other airlines. The airport is just 5 km (3 mi) from the city center. Dublin Airport. Located on the other side of the border and serving the Republic of Ireland’s capital, Dublin Airport is nonetheless only about 100 minute drive south of Belfast. 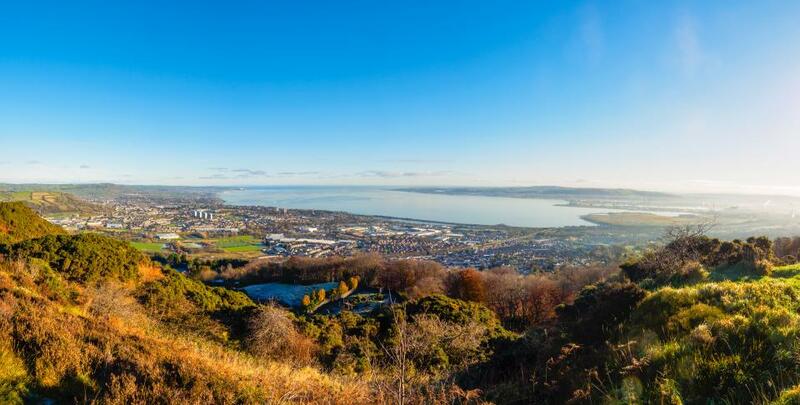 Although Northern Ireland is geographically separate from the rest of Britain, it has a similar oceanic climate with high and steady precipitation and relatively little temperature changes throughout the year. The average temperature is 15 °C (59 °F) in July and August and 5 °C (41 °F) in January and February. Belfast is made up of nine unofficial quarters based on cultural zones. Each of them prides itself on a unique history, local character, and annual events held in them. Some of the more famous one are the Cathedral Quarter, the Titanic Quarter, and the Gaeltacht Quarter. Botanical Gardens. Covering 28 acres, the large and beautiful Botanical Gardens is one of the nicest places of Belfast. Its standout attraction is the Palm House which houses many unique tropical plants and animals, including a 400-year-old Xanthorrhoea and even carnivorous flowers. Belfast Zoo. Another place for a great day outdoors, Belfast Zoo houses many unique animals, from Asian elephants and Western lowland gorillas to giant anteaters and Jamaican boas. The zoo is located on the slope of Cavehill, a basaltic hill that’s a great natural attraction in itself. Ulster Museum. With fascinating collections that include ancient (and more recent) historical artifacts, zoological and botanical specimens, and great exhibits of wildlife art, Ulster Museum offers a fascinating and comprehensive perspective on what Northern Ireland is about. The museum is located in the Botanic Gardens in the southern part of the city. The United Kingdom drives on the left-hand side of the road. On-street parking is usually heavily restricted. Never park on a white, double yellow or double red line (stopping on motorways and next to red lines is illegal). You are not allowed to use your mobile phone while driving, unless you use a hands-free system. Unless specifically indicated otherwise, the speed limits are 112 km/h (70 mph) on motorways, 112 km/h (70 mph) on dual carriageways, 96 km/h (60 mph) on single carriageways and 48km/h (30 mph) in residential areas and areas with street lightning. In England, Wales, and Northern Ireland, the legal alcohol limit is 0.08% for both experienced and novice drivers. Do keep in mind, however, that in Scotland the legal alcohol limit is 0.05% for both experienced and novice drivers. Exceeding the limit can lead to large fines, a suspended license, or even imprisonment. The insurance and documentation of the car needs to be in it whenever you’re driving. If you’re the driver, you need to have your passport or ID card with you at all times. The emergency numbers are 999 and 112. Currently there is only a single toll road in the United Kingdom, the M6 toll in England. You also have to pay a toll for using a number of bridges and tunnels. As an alternative to the M6 around Birmingham, the M6toll is a 43 km (27 mi) long portion of the road, also known as the Birmingham North Relief Road (BNRR), that relieves congestion on the M6 itself. There are toll gates where you can pay by either cash or credit card. As of March 2019, the price is £6.40 for using the toll road from Monday to Friday (from 6 a.m. to 11 p.m.), £5.30 for using the toll road on Saturday or Sunday (from 6 a.m. to 11 p.m.), and £4.10 for using the toll road at night time on any day (from 11 p.m. to 6 a.m.). Find out more on the M6 Toll official website. Find out more about toll roads in the United Kingdom on the European toll road website. Ulster Folk and Transport Museums. Located in the nearby town of Cultra, these two museums are both worth a visit. The Transport museum has interesting exhibits of steam locomotives, vertical take-off aeroplanes, and horse-drawn trams, while the folk museum offers a full re-creation of an old Irish town. Carrickfergus. Famous for its beautiful Norman castle, Carrickfergus is a town with a truly historic feel. Its atmosphere can be soaked up by either walking its narrow streets or going on a stroll along its beautiful marina. The town is just a 30 minute drive north of Belfast. Killough. A small seaside village, Killough is home not only to tranquil beaches, but also to Ballynoe Stone Circle, a late-Neolithic monument that is something like Northern Ireland’s answer to Stonehenge. From Belfast, it is only an hour’s drive south. The most popular rental car types in Belfast are compact, economy, and mini. The most popular rental car is the Renault Clio. Travelers also love the Vauxhall Corsa and the Hyundai i30. Derry. Also known as Londonderry, Northern Ireland’s second city boasts historic sites dating back nearly 1500 years, as well as a number of more recent churches, museums, and murals. Derry is about 112 km (70 mi) northwest of Belfast near the border with the Republic of Ireland. Dublin. The capital of the Republic of Ireland is truly a fun place to visit. It boasts many tourist attractions, fascinating architecture, and many famous past and present inhabitants. Easy to reach from Belfast, it is only about two hour’s drive south along the coast. Galway. Located on the coast of the Atlantic, this university city is famous for its nightlife, but equally important are its historic sites, art spaces, and role as a modern center for the Irish language and culture. It is about four hours drive from Belfast to Galway, but in this case, the long distance is well worth the time. Visit on the month when the rental prices are the cheapest. According to our data, visiting Belfast is the cheapest in September when renting a car is nearly 50% cheaper than the yearly average. Which is the cheapest month to rent a car in Belfast? Car rental prices in Belfast vary a lot according to the time of year. This graph compares month-to-month price changes to help you find the best offer. The best month to rent a car in Belfast is September (when prices for an Economy class start from $25.87). This is 48% cheaper than the yearly average and 59% cheaper than renting in February (when rental prices start at $63.57 for a Compact class). Knowing this can help you find the best price. What’s the usual rental length in Belfast? Travel lengths vary from month to month: in April, travelers rent a car for an average of 22 days in February, the average rental period is 4 days. What's the most popular month to rent a car in Belfast? While travelers visit Belfast year-round, the most popular month for renting a car is August, and the least popular is April. Super city to visit even by car. Found free street parking for our day out in the city. Great for a trip to the Antrim Coast & along Strangford Lough with many interesting & wonderful places en route. If you’re not used to driving on the left or Irish roads I would recommend getting the smallest car that can accommodate you. Also, I got in automatic transmission so I would not have to change gears with my left hand. Driving on the left wasn’t as difficult as I thought it would be. Belfast was a truly beautiful place with lots to see and do. We were located centrally and therefore could park the car up at the hotel. That being said, a car was needed to get from the airport to our accommodation and then onto Dublin. Belfast and northern Ireland as a whole is a fantastic place to visit. There is something for everyone and the friendliness of the people make you want to return. You may want to ensure the car had automatic transmission if you're at all squeamish or unfamiliar with driving in the UK and Ireland--mine did not. It all worked out, but it is challenging to most drivers unfamiliar with driving on the left side of the road.